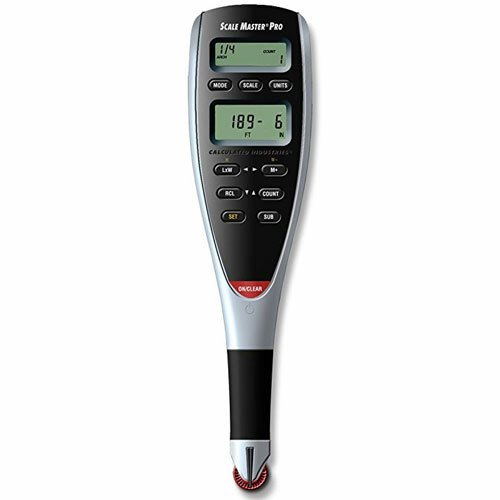 The Calculated Industries Scale Master Pro Digital Plan Measure 6025 gives you simplicity, versatility and accuracy with a new ergonomic design with comfort grip. The Scale Maser Pro comes with improved weight balance, dedicated function keys and a new dual LCD display for left or right-hand use, while maintaining the same award-winning ease-of-use, quality and reliability you expect from a Scale Master. No other plan measure gives you more for less! 72 built-in scales for more versatility. Six user-set custom scales easily calibrate to out-of-scale plans and plan books. Two built-in memories for easy area/volume and storing values. Dimensional units and dedicated functional keys ease use. Comes with a 1-year warranty. Improves accuracy, speed and confidence. Accepts dimensions rolled in either direction. Calculates linear, area and volume take-offs easily. 72 built-in scales, 39 imperial and 33 metric, cover most practical print/plan applications. 6 user-set custom scales for out of scale or faxed plans. Built-in counter and many dimensional units for greater versatility. Subtract measurement key subtracts distance, rolled while pressed. 2 built-in memories. Lock switch sets mode and scale to prevent accidental changes while measuring. Large, easy to read LCD display.